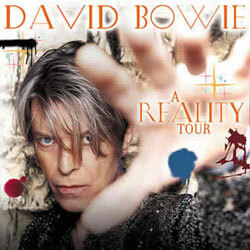 In 2004, the 12,500 capacity Sydney Entertainment Centre held two back-to-back concerts of David Bowie's A Reality Tour. 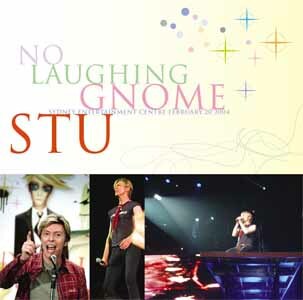 Built in 1983 and situated on the fringe of Chinatown, the venue had previously staged no less than EIGHT Glass Spider shows (a personal record for Bowie in terms of most consecutive concerts at any one venue). 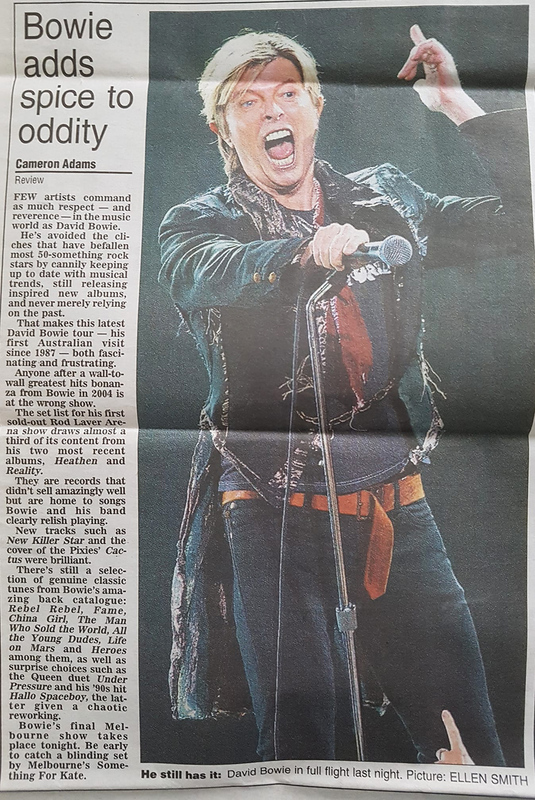 The two David Bowie concerts in 2004 were no exercise in nostalgia - on the first night, Bowie debuted 'Fantastic Voyage', 'I've Been Waiting for You' and '5:15 Angels Have Gone' for the very first time on Australasian soil. "The new songs are OK, but I wish he'd do more oldies. He doesn't do many oldies does he?" "Crutches are waving the air. What more can you ask for? What an extraordinary country!". 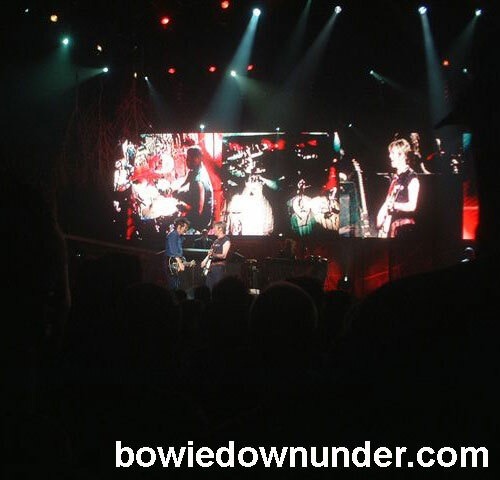 David Bowie at Sydney Entertainment Centre. 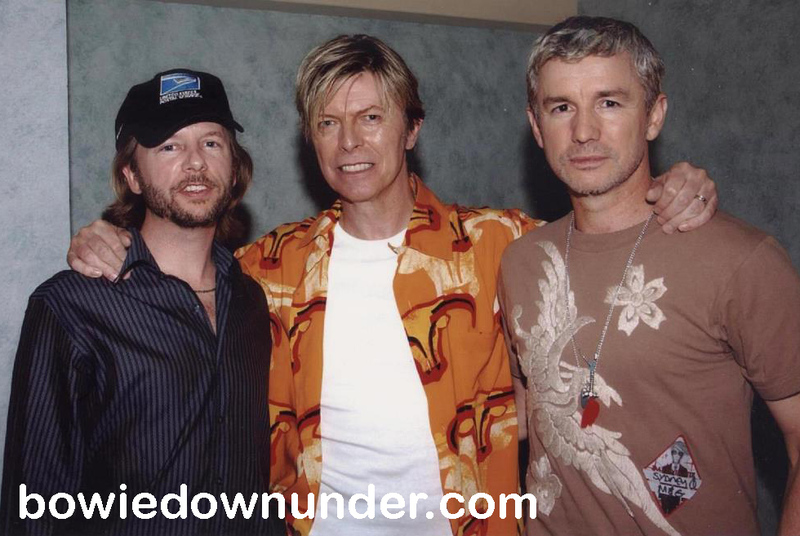 During the band intro, Bowie recalled that his guitarist Gerry Leonard was once a professor of micropaleontology at Dublin University but threw it all away to play guitar! "He's got some of the most amazing fossils. That sounds really lewd doesn't it? I mean why should that sound lewd? You want to see his fossils? But they're micro-fossils. They're tiny little - it's all that stuff that collects at the bottom of the ocean." 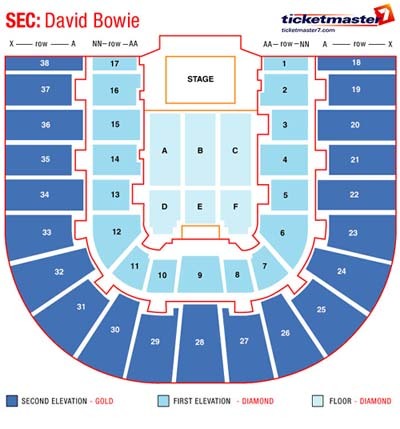 Bowie at Sydney Entertainment Centre. The concert finished with a four song encore (the same as Brisbane but now substituting 'Always Crashing in the Same Car' for 'I've Been Waiting for You .... an appropriate song given the vast amount of time since his last concert on these shores!). "Great to be back....really great...... See some of you tomorrow." 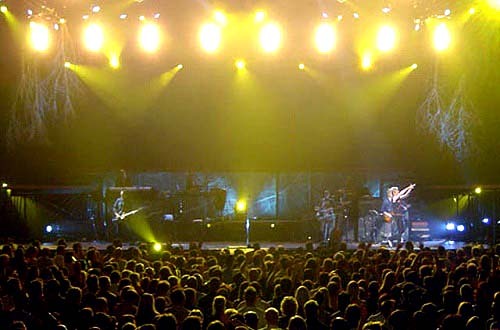 View a complete transcript and set list for the first night here. 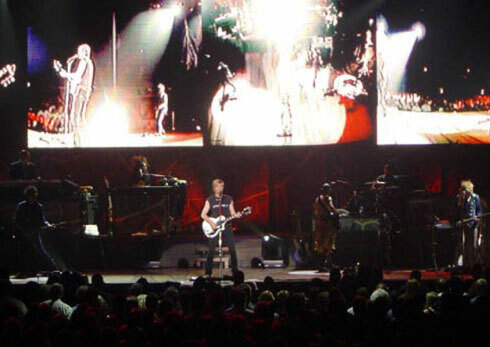 The second night stated off similar to the first - 'Rebel Rebel' and 'New Killer Star', however, those lucky enough to witness both concerts, may have begun noticing the band's ability to add and drop songs from only the third song in. "That was a song about a dress. You wait until I start the songs about the women". 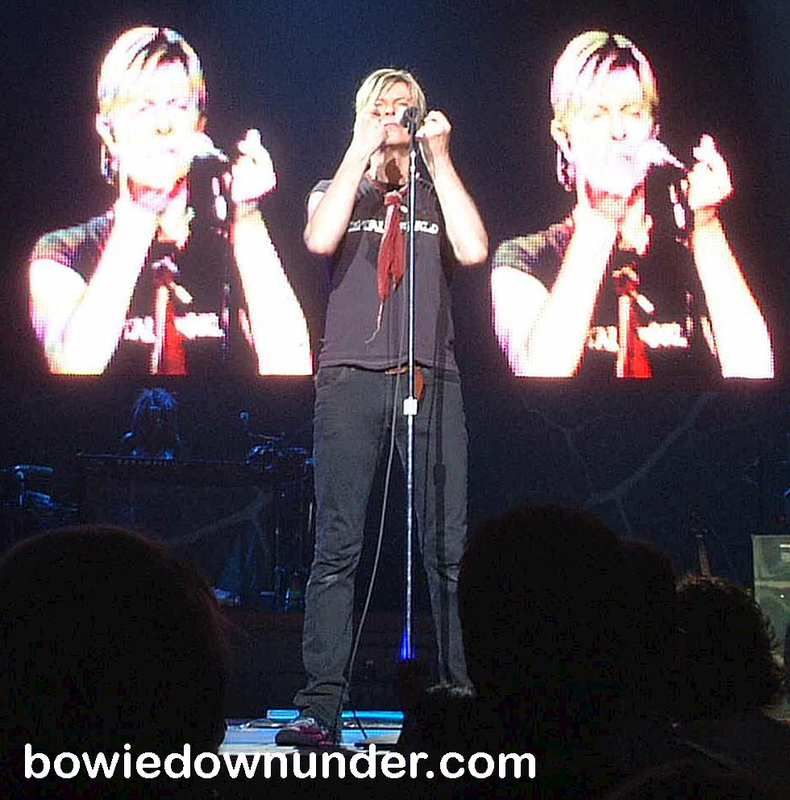 Bowie at the Sydney Entertainment Centre. Photos by Daxem. 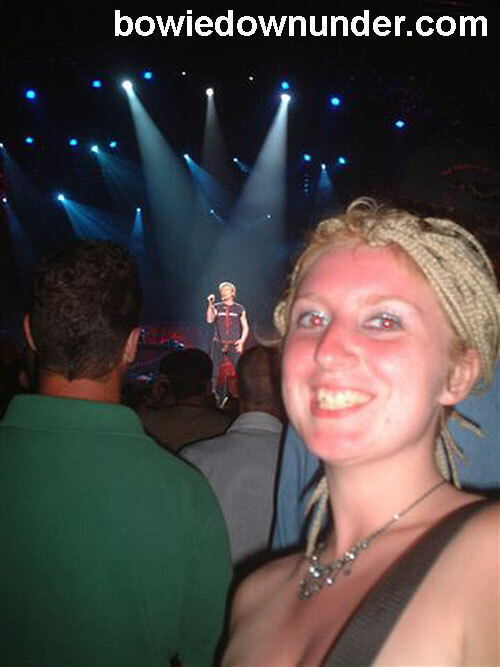 "There's a goth girl ..... look I've got a goth girl in the audience. Hi darling. How you doing? Got the teeth? ..... Oh yes I see you have." 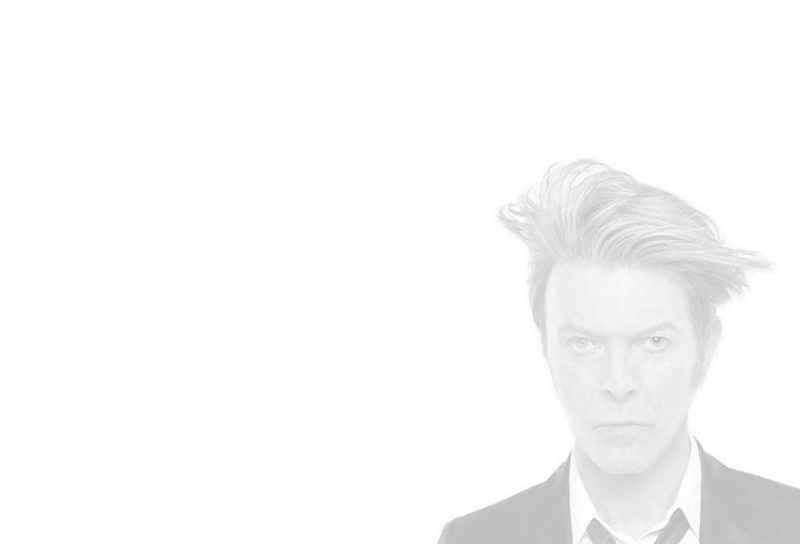 During the band intro, Bowie kept the professor joke running from the previous night. Now Catherine Russell was introduced as a leading professor in Quattrocento Italian history! Bowie then played 'Under Pressure' with Gail Anne substituting for Freddy Mercury (a momentous task but she does extremely well at this). 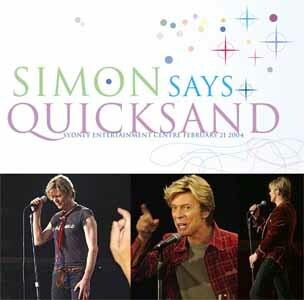 Seventeen songs in came the biggest surprise of all .... and with Mike Garson's introduction of two alternating notes on a vibraphone, we heard the the debut of 'Quicksand' on the Reality tour. "We haven't done this for weeks. I mean weeks! Seriously, that's a long time for us". "I see .... this one's got a lot to do with Sydney". 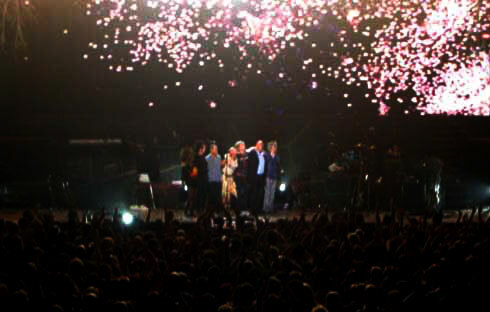 The band then launched into an extremely powerful version of 'Lets Dance'. View towards Sydney Harbour - from the 1983 'Let's Dance' video. 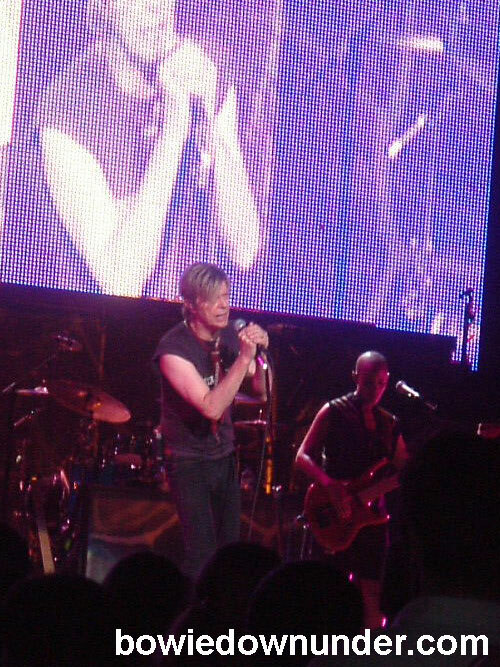 Bowie then played the Velvet Underground's 'White Light, White Heat' which he described as being from "a million years ago". Before commencing the next song he announced "this is not quite a million years old but it ..... (points to the sky) .... starts up there" . Queue 'Ashes to Ashes'.
" I heard a really good version of that song 'Ashes to Ashes' - kinda hip hop by an Australian artist, I think her name was Danielle Spencer. It was really very good". 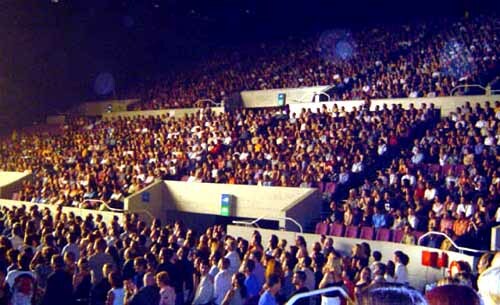 Sydney concert audience including Russell Crowe and Danielle Spencer. Photos by Daxem. 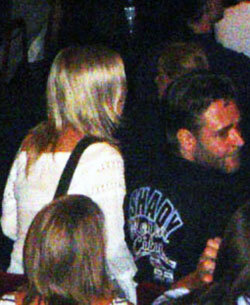 As it so happens, Danielle Spencer and her husband Russell Crowe were spotted keenly observing from the stalls. As of 2009/10, Danielle has gone on to release a second album titled Calling All Magicians, produced by none other than legendary Bowie producer, Tony Visconti. Danielle Spencer and Tony Visconti (January 2010). "I would also like to very much thank Something For Kate for doing such an excellent job in Australia. (mock Australian accent...) A really good band. We're gonna keep 'em for the rest of the tour". "We've had a wonderful, great pleasure being here in Sydney. 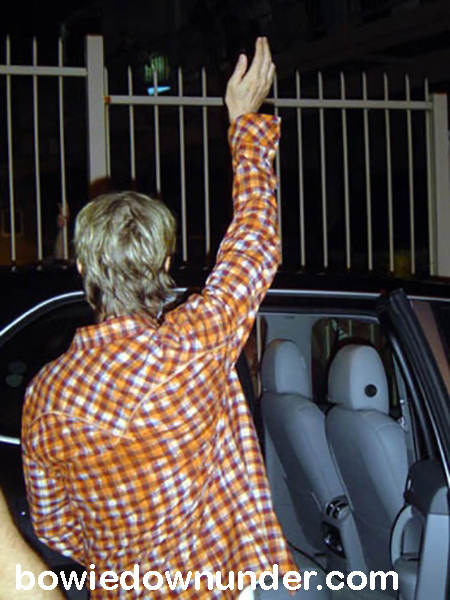 Some of the band have never been here before and they've had the most excellent time". Pianist Mike Garson now back in the limelight as Bowie launches into 'Bring Me The Disco King' backed by Sterling Campbell's shuffling jazzy beat. This potentially foretelling piece of music ("soon there'll be nothing left of me....nothing left to release") was played for the first and only time on the AUS/NZ tour - something quite special whether audiences knew it or not. Finally, an unstoppable all-Ziggy trilogy to finish things up: 'Five Years', 'Hang On To Yourself' and the closer 'Ziggy Stardust'. 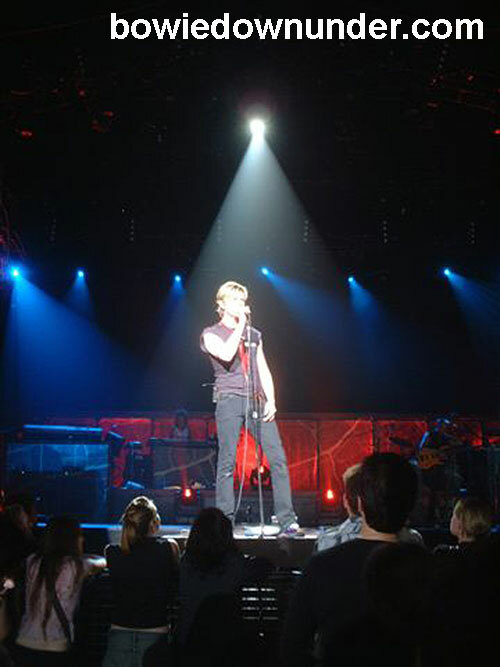 View a complete transcript and set list for the second night here. 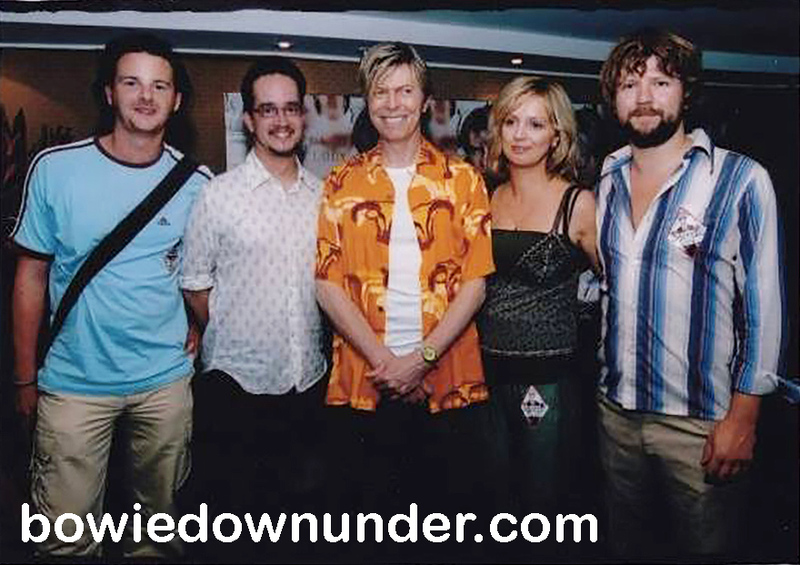 Backstage in Sydney, Bowie met with guitarist Brendan Gallagher (local musician that added guitar to the Marius de Vries mix of "Survive"), film director Baz Lurhman, fashion designer Collette Dinnegan, actor David Spade and others. Also present were Merrick & Rosso (Nova 969 breakfast radio). "[Bowie] was cool. 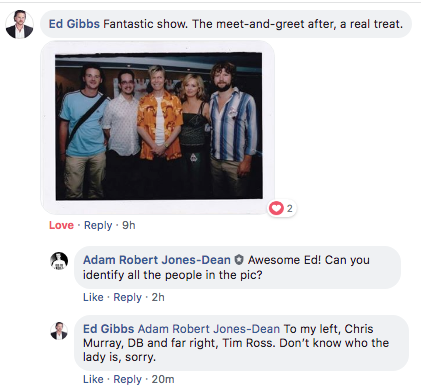 We talked music, Earl Slick and my chord book which a journo friend gave to him in NYC a few years ago." "He looks good even at 1 AM"
David Bowie and Brendan Gallagher. 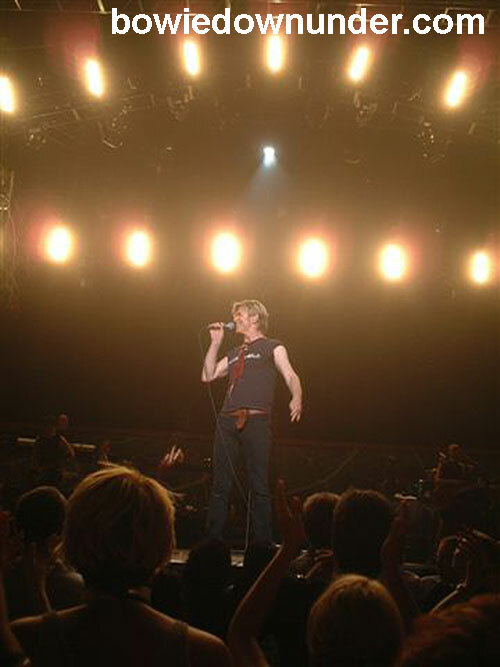 Backstage Sydney, Feb 20, 2004. Thank you Brendan for this pic! 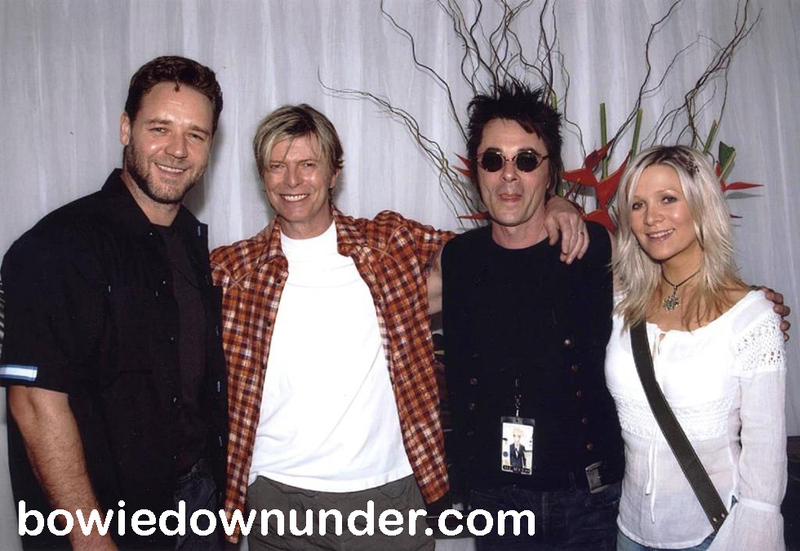 David Bowie and Earl Slick with Russell Crowe and Daniel Spencer. 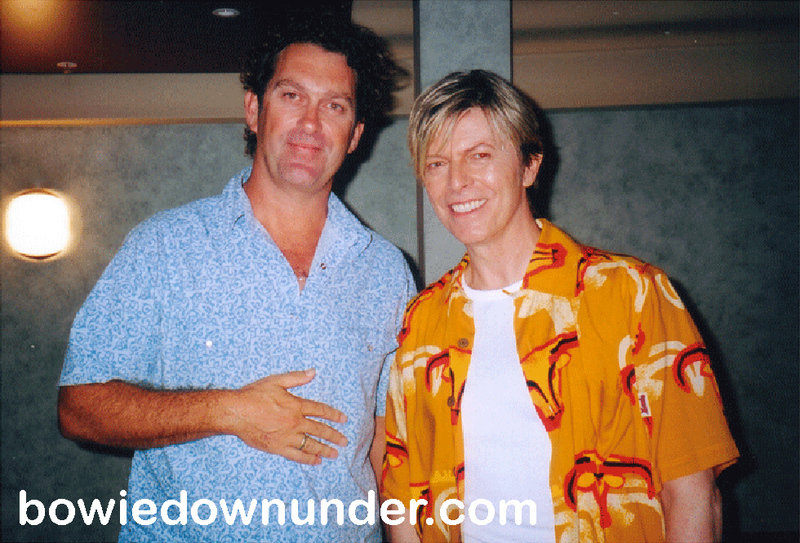 Backstage Sydney, Feb 21, 2004. 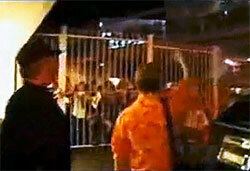 Hundreds of fans also waited outside for Bowie. Whilst doing so, they all sang along to his 1969 hit 'Space Oddity' remarkably well and DB himself came out himself to witness. David Bowie outside the Sydney Entertainment Centre. Film footage of this occurrence was later shown on the television show ROVE. 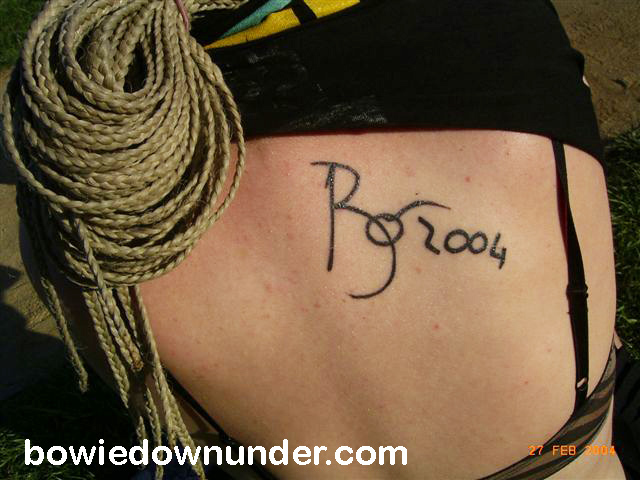 In Sydney, a Bowie fan named Jen that had traveled over from the US managed to get something signed ----> her back. She had this made into a tattoo! 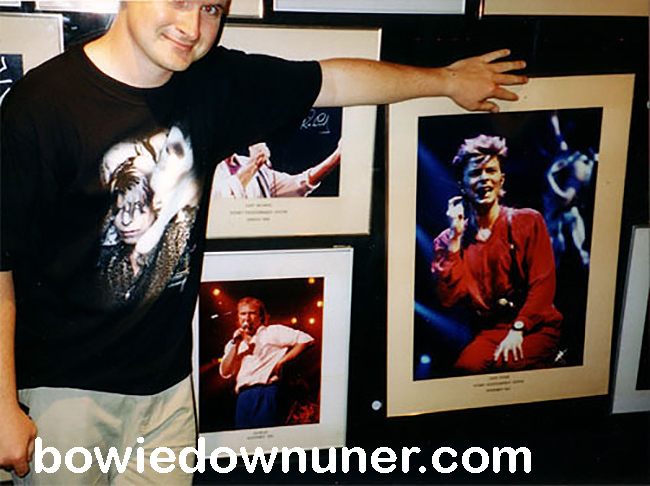 While leaving the Sydney Entertainment Centre, I couldn't help but notice an arrangement of photos in the front foyer: Bowie - in his Glass Spider guise - sitting right next to his evil nemesis Phil Collins. Me in the foyer of Sydney Entertainment Centre. 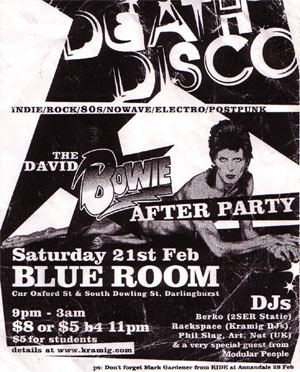 In the local music press, a couple of Sydney clubs advertised themselves as hosting a Bowie 'after party'. The first of these was a folly - and played completely unrelated music save for maybe 'Rapture' by Blondie. The second - a local goth club - at least played some Bowie ('Fashion' and 'Hallo Spaceboy' if I recall correctly). Front page of the Sydney Morning Herald Entertainment Section (following day). Sydney atrticle sent in by Glen Freestone. Feb 20 - More details here. Feb 21 - More details here.